In this episode, Lisa speaks with Jim Collison. He manages a technology team at Gallup in Omaha, Nebraska. He also champions the community for Gallup Certified Strengths Coaches, so he’s the poster child of the movement for many strengths professionals. 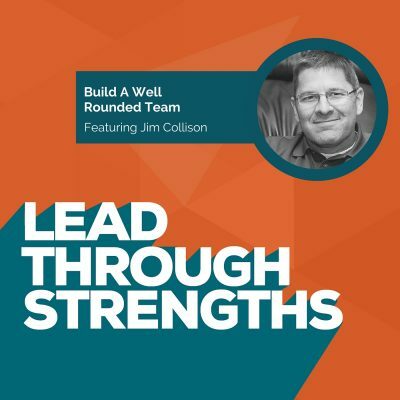 You’ll find this podcast particularly interesting if you’re ready to implement strengths-based coaching with your team. Jim gives specific examples that will get your wheels turning. He offers ideas for building a stronger team. He shares stories from his strengths based parenting experiences. And he shares examples of how he applies natural talents on the fly. He does this every year as he manages large teams of interns and only has a few months with each person. All the while he’s partnering with other people to maximize the productivity on the team. Jim’s Top 5 Talent Themes from the Clifton StrengthsFinder are Arranger, Woo, Maximizer, Communication, and Activator. He’s a great example of someone who doesn’t waste time wishing he had more of his “lesser” talents. Instead, he pairs up with those who bring the talents that are tough for him to call on. Every person’s strengths journey begins in a different place. Jim’s started at home, which led him into a career where he gets to apply his top talents and encourage others’ every day. He tells the story of how he took the StrengthsFinder Assessment, and was so excited, that as soon as he got home, he said to his wife, “You take this too! Let’s parent this way.” This had a profound influence on his life and the way they parent each of their unique children. He confesses that he thought one of his sons was apathetic. He got an enlightened view and changed their whole relationship once he looked at it through a talent lens. By looking at their children, and understanding what their individual strengths were, Jim and his wife were able to support each one and encourage growth in a positive way. Dig into your own top 5 talents, and strive to understand them at a deep level. You need to “live that life and walk that walk” every day. You have to invest in each talent theme to turn them into strengths on the job. Create a Team Grid that includes every team member’s top 5 StrengthsFinder talent themes. Use the grid to get a big picture view of the overall strengths of the team (and where your team lacks strengths). Remember, you want well-rounded teams, not well-rounded individuals. This is a great process for seeing who you need to lean on for different responsibilities and initiatives at work. Utilize the Team Grid as a conflict management tool. For example, if you have two team members who are in conflict, you can use this knowledge of the conflicting strengths without them realizing that’s what you’re doing.Tell the two people “ I understand, Bob, that you are adaptable and can go with the flow. And, Anna, I understand that you need structure. As you two interact on this project, please remember to take that into account.” Both people will feel understood and more open to compromise. Set up the potential conflict and ask them how this shows up at work for them. When it comes to projects, don’t spend time trying to improve your own weaknesses. Instead, spend time building partnerships by looking for someone who has strengths that are complementary to yours. Then, this is the big part: ASK. Ask the person to work with you on your project. If you don’t ask, the answer will be no. You’ll be surprised at how often people jump at the opportunity because you’re requesting help in areas they love working in. This will lead to a well rounded team. That’s so much better than trying to fight your way to a well rounded you. Live Into Talents In Small Bites. If you oversee a team, Jim says not to undertake huge strengths initiatives out of the gate. It’s not because he doesn’t believe in them, it’s because they almost always fail. Instead, take little bites at a time. Little changes are not as noticeable, and are much easier to achieve. People don’t resist the small bites. They add up to a lot of momentum over time. When it comes to specific assignments, pay attention to what your team members enjoy doing, and give them those tasks. When you give someone a job they want to do, the management part becomes a side thing. What you’re really doing is giving them opportunities to let them soar. If you’re a manager and you give assignments, remember to stand back and let people do their jobs. You can help them with adjustments to keep them on course, yet that’s about all they’ll need when they’re in their strengths zoze. Stay focused on the outcomes. Let them approach the “how” through their unique talents. This even holds true for remote teams. Here at Lead Through Strengths, we’re based in Austin, Texas, yet we each work remote from each other. The outcome is the focus of the work, and way the work happens in between is based on each person’s talents. Keep Growing. Jim’s last tip is to go to the Gallup Coaching website and check out all the free resources. You don’t have to be a certified strengths coach to access these helpful items that will help you grow as a leader. Lisa Cummings: [00:00:06] You’re listening to Lead Through Strengths, where you’ll learn to apply your greatest strengths at work. I’m your host Lisa Cummings. And I’ve got to tell you, whether you’re leading a team or leading yourself, it’s hard to find something more energizing and productive than using your natural talents every day at work. [00:00:20] And, today, you’re going to hear from one of my very favorite people at Gallup. I brought him on the show because managers are always asking me for new ways to spot talents of people on their teams, and this guy is so ninja at that. And, plus, he’s kind of a walking talent party, so he knows how to see talents in people, he knows how to fit them into the bigger picture, and he finds all the right words to really enroll people behind a vision. So, seriously, I have to think that people on his team must feel like they have a ribbon-cutting dedicated to them personally every day as they walk into the office. [00:00:56] So, your guest today is from San Jose. Now he lives near Omaha, Nebraska where Gallup is headquartered, and maybe we’ll get to learn a little bit more about the space called Silicon Prairie. A-ha, listeners, have you heard of that yet? As you might imagine, from a guy with Silicon Valley and Silicon Prairie connections, your guest manages a technology team at work. And you’re about to learn from him some wickedly brilliant ideas for nurturing the talents of each person on your team, and in yourself. So, Jim Collison, welcome to the show. Jim Collison: [00:01:30] Thanks, Lisa. Great to be here. Man, you put the pressure on from the very start, so I hope I can live up to those high expectations. Lisa Cummings: [00:01:37] I know you’ll live up to the ninja expectations. [laughs] As everyone knows who’s listening, this show is all about exploring strengths, how to find them, how to leverage them. Now, you work at Gallup so you’re fully steeped in this world of strengths. Let’s talk about you nurturing your own. So, if we can go back, back, back, if you can remember what it was like when you first took StrengthsFinder. How did you react to the list back then? Jim Collison: [00:02:01] Yeah, and let me kick it off the top five just so folks know that that’s always the first question I get, “What are your top five?” And so I am an Arranger, Woo, Maximizer, Communication and Activator. All influence; I live life on the edge so to speak. I’m always out in front wanting to be doing a lot of things. I think by talking, which is a little scary sometimes. But in meetings some of my best ideas come to me while I’m talking, and so it’s part of the Communication piece and I love to be out front. [00:02:30] It hasn’t always been that way. There were inklings of that. And back, 10 years ago, when I first took StrengthsFinder, being in Omaha, being close to the corporate office here, I worked for a company at the time that was one of the first ones to do kind of a strength-based engagement as a company, and have everyone in the organization take StrengthsFinder. And back in those days the book was First, Break All the Rules and Now, Discover Your Strengths. It was those two books. Still available actually, if you go out and buy those. [00:02:59] A lot of folks purchased their Strengths now through the StrengthsFinder 2.0 where they come to the Gallup Strength Center.com to get those done. But when I first took it, and I remember getting those results back, and thinking, “Man, wow. Okay. There are some things here that I need to kind of work with and think about.” And it was so profound in the sense that it gave me this framework in which to talk about myself and some of the things that I was good at, that I took it home. [00:04:04] And every couple of years one would get old enough and we’d have him take StrengthsFinder and so we’d get some more clues. As an example, my oldest, his number one is Responsibility. Well, once we knew that, I know I could trust him in just about every situation. If he said he was going to do it, he would. And even though as a teenager, maybe in his raw form, I knew the talent was there to be able to do it, so the trust level went way up with him. We were able to kind of say, “Hey, we need you to stay home and watch the kids,” or, “Help us with this,” or, “I need you to get this done.” And he would get it done and we celebrated those moments. [00:04:36] So, it was things like that. It was like when my middle child, when we figured out he had Adaptability, and we had always thought that was laziness because he goes with the flow. We would say, “Hey, what do you want to do?” “Huh, well, you know, whatever.” And we’d be like, “No, make a decision.” The rest of us in the family are all very high Activators. Jim Collison: [00:04:57] I know. Right on. And when we took the assessment, he was like, “Oh, you know, that makes sense. Here I’d been trying to drive this kid.” And so we had to do some backpedalling in our parenting and kind of unwind some things that we had done kind of putting pressure on him to do things that, frankly, he didn’t want to do or he wasn’t interested in, or would’ve just went with the flow. So that was the profound impact for me. Well, it took 10 years to play out at work. It almost immediately took an impact at home. Lisa Cummings: [00:05:25] I love that you brought the home example up as well because I don’t know what it is, but when I do training events people think immediately of their home life and they can apply it there, but they’re trying to stop it. They’re like, “Ah, that’s my home. I shouldn’t be trying to apply it there. I need to keep thinking of it in a work setting.” And sometimes, as you were talking about your example with your kids, I’m thinking, “Oh, that is just so directly tied to what’s it like to lead a team.” Not that they’re children, but that you’re seeing it in people that you’re with all the time. [00:05:54] It’s so easy sometimes to spot that once you have the language with people on your team, and if, hey, if your home life is where you can make the connections most easily, do that first so you can get used to them, you can see what they look like and you can explore it a lot more easily that way. Jim Collison: [00:06:10] Yeah, and I think parenting gets you ready for management. By the way, I have five kids and they all push me to the limits at times. Yeah, I love them. They’re great kids, but they’re kids. And a lot of the life lessons I learned that I brought to management, and that I still continue to bring to management. I’m fortunate here at Gallup I work with our high school and college internship programs, and so I now have 40 kids in the system that I work with, and my own five kind of prepared me on how to manage those kids. [00:06:36] Twenty years ago I did an internship at a church for the summer as a youth pastor, and it was a disaster. And I just didn’t know what I was doing, and I wasn’t very good at it, and I was intimidated by the kids. My own kids kind of taught me how to work through that. And someday maybe I’ll write a book The Best Management Lessons I Ever Learned I Learned From My Own Children because there are tons of things. If you can manage that, oftentimes a work management situation is a piece of cake. [00:07:04] And so taking them home first and really working on those for a long time, and, of course, I came to Gallup eight years ago. And, you’re right, we practice everything we preach. In fact, we overdo it here in some regard. So, I literally have some of kind Strengths discussion every single day. Jim Collison: [00:07:20] In some form or fashion we are talking about it. And so we embed it here, and I’ve grown as a manager here as well. But it is one of those things for me that StrengthsFinder gave me the tools to really understand the person. And then when we come to the management piece it’s about, “How do we put those? I’ve got all these pieces.” It’s almost like Scrabble and I’ve got all these letters and I’ve got to figure out how to put them together in order to make a word. And the more strategic I am about putting the word together the more value there is in the word. [00:07:53] Not every situation is the same and no two managing situations are the same. Once you start laying those first letters the whole board changes and you’ve got to be constantly adapting and taking advantage of the letters you have and those things that you’ve been dealt. A lot of people approach management from a, “Well, if I could only do this.” Well, guess what? Sorry, you can’t do that right now. You’ve got to do with what you’ve been given. So don’t look back, look forward. And how can you take advantage of the team that you currently have, and really maximize their value? [00:10:02] You know what? I’d encourage you first go on a journey of your own. Like, really dig into your top five. We provide tons of resources that are available to folks that are for free. Now, we encourage everyone to have a coach. Lisa, you’re one of those coaches. You go in and it’s great to have those engagements. But there’s a lot of work that you can do on your own as well. When we think about the reports that we have available and all the videos that we make available to folks about their top five and some of those things. [00:10:27] So, I encourage someone to dig in and understand who they are. Really live that life and walk that walk first. And then, slowly, begin to look for situations with their team where they can begin to implement. And it really works best in an environment of the team grid. So if you can get your team to take their top five and put those in a grid and start to understand situations. [00:10:50] I like to use StrengthsFinder also as a conflict management tool between team members, and sometimes that makes a nice time to break it out. And don’t call it that, like don’t say, “Okay, everybody, take out your StrengthsFinder team grid, and now let’s hammer you on this thing.” No, it gives you some keys, it gives you some guides, it gives you some questions to ask, that you don’t even have to say you’re using StrengthsFinder to do that. [00:11:16] For example, we talked about the Adaptability with my son and understanding that. You might have a situation where you have someone that’s high in Adaptability and high in Deliberative or high in Consistency. So we’ve got someone who could go with the flow and we have another person who likes structure and thought and think it out and plan it, right, from that standpoint. You’ve got two of those people on your team doing that and they’re going to be running into each other. You don’t have to call those out in the conflict management that you’re doing. [00:11:43] You can just say, “Oh, you know, hey, I understand that your abilities here to be adaptable and then, hey, I understand that you need structure.” And maybe, for the first time, someone will be speaking to them understanding who they are and affirming that, right? And these two can coexist, but they need to be kind of named first in a lot of cases. So, Lisa, it gives us the ability to have this kind of, almost like this, you said ninja early in the show, to have this kind of ninja-like second, or third, or fifth sense that allows us to have some insight into who these people are, and then give them opportunities to succeed based on those Themes, based on those Strengths. [00:12:23] Everybody wants to succeed. If you show it as a proven winner, if you come out the gate and say, “Hey, this stuff works. I’m not going to tell you about it. We’re just going to do it.” I think they have a lot better adoption. They may be doing it already once you start doing it that way. Then don’t care what the labels are. They just want to be successful. So that, for me, so you’ve got to live it. You’ve got to live it yourself first, and then take those in and help your team be successful with it. Everybody wants to be successful. Lisa Cummings: [00:12:52] And also if they’ve seen you begin to change, they’ve seen you begin to consider yourself in a different way it’s going to show up and you’re not going to be the guy who only ask them questions about the next acquisition. Lisa Cummings: [00:13:05] They’re going to see that evolution as well, and they’re going to say, “Hey, you’ve been a little different lately in the way you’re approaching things,” and then it will feel more natural anyway. Jim Collison: [00:13:13] Yeah, and it’s a long-haul journey on this. This isn’t, “One week I’m going to manage this way and if it doesn’t work I’m going to move on.” It really is a journey. I mean, it’s a six months, it’s a year, it’s two years. It’s a way of taking a framework and changing the way you think about people and focusing on what’s right about them instead of trying to fix their weaknesses, right? Jim Collison: [00:13:33] And so it just takes time. Anybody who wants and one and done, I kind of say, “Maybe you should do something else because this is a lifestyle, not a program.” And so I’d encourage folks to really get steeped in it first. Lisa Cummings: [00:13:46] Totally. And probably you and I had a similar experience having looked at and lived ours for 10 years now. At the beginning you have these big insights, and then another layer, and then another layer. And here I am more than a decade later still getting new layers of insight about it because the more you apply it the more you see new things you couldn’t see before until you lived in it. Jim Collison: [00:14:08] Right on. A perfect example, like I did not understand my Maximizer for maybe six or seven years. Lisa Cummings: [00:14:14] Oh, wow. Jim Collison: [00:14:15] And I think really in the last two or three, and maybe in particular in the last year, have been an eye-opening experience for me where I’m looking at, “So how does that Maximizer, this idea of quality and sorting? How does that play out for me? And how am I maximizing it?” I know you’re not supposed to use the word in the definition. But how am I maximizing my Maximizer? And I think it’s still raw in me in a lot of cases. I think there are some things there that I’m not taking full advantage of the Theme that I have. [00:14:48] And so even 10 years into this I’m still learning things about me, and just in my top five, that are eye opening. And how can I take advantage of that Theme, that talent inside of me, and really make it hyper-productive? How do I do that? So that’s an example of, “Hey, so you think 10 years, ‘Oh, man, this guy has got it all together.’” Heck, no. This is a journey of a lifetime. I’m continuing to try to figure out how to take advantage of the pieces. [00:15:15] The webcasting stuff that we do at Gallup, we have all kinds of it. I mentioned these resources on our coaches blog, so if you go to Coaching.Gallup.com. We create these videos every single week. Well, that’s a Woo communication thing. And here at Gallup that’s been something I’ve been allowed to do just in the last couple of years. And so that’s not like, that’s just all of a sudden came, “Oh, I should be a podcaster, right?” Well, no, it didn’t come that way. It took some years of discovery and trying things and some of those. You’ve got to kind of make some mistakes and figure some stuff out. Lisa Cummings: [00:15:45] Yeah. Now, okay, you’re making me think of another thing that managers think of as an obstacle when they first get into that, which is like I look at your role and you manage a technology team. Yet, you are also known in our certified coaches circle as you’re our guy, and you’re there all the time. We would think that’s your full-time job because you do so much of that and you do so much with these Theme Thursday channels and all the things that you produce. [00:16:14] And so one thing I hear from manager is, “Man, from the practical side, this sounds really good but aligning the work to the talents,” beyond the relationship stuff you talked about, which is a beautiful element, then they want to think about aligning the work to the talents. But they’ll go, “Oh, that sounds like a good idea but I don’t know how to realistically shift responsibilities around. It seems real hard. It doesn’t seem scalable.” So how do you get it started with that? And how does it look? And you’re a great example because you live this out. You’re doing things that wouldn’t be in your job description, but they suit your talents really well. How does that all play out? Jim Collison: [00:16:48] Yeah, in fact, I really have three jobs for Gallup. One is I built and manage all our internship programs. So we have technology internship programs for both high school and college. I do all our webcasting, which is kind of a full-time job, kind of all in itself from that standpoint. And then I manage all those resources which is kind of, again, those are like three full-time jobs. Lisa Cummings: [00:17:11] Have you cloned yourself and you just haven’t told anyone that you really found that secret? Jim Collison: [00:17:15] You know I wish I could but I probably couldn’t even manage myself if I had a clone of me. It’d be scary to see me from the outside. But that being said, I prefer in this, you know, I mentioned just discovering my Maximizer Theme over the last couple of years, and this is really where I’m seeing this starting to play out. In that, for me and managing, it’s taking little bites of the elephant. Oftentimes we try to approach these situations and fix it all in one week, or we’re going to have these big initiatives and we’re going to completely change everything, and this is the way it’s going to be today, starting today. Those kinds of things aren’t sustainable. They almost never work, these big initiatives. [00:17:52] I like the turn the water up one degree at a time. And the Maximizer, I’m trying to make a better decision today than I made yesterday. I try to bring it down to that daily level, “How can I change what I’m doing today that has an affect or is better than I did it yesterday?” And so it’s little tiny changes. [00:18:11] As an example, our high school internship program started three years ago. We started with 18 kids, and we ended up with seven at the end for the summer. So the next year we started with 22 kids and ended up with 10 at the summer. This year we started with 40 kids and it ended up with 14 for the summer. So each year I’m trying to bump those numbers up a little bit. [00:18:35] I have a partner that helps me. I don’t do all this stuff. I don’t do any of this stuff alone. I have to have great partners. One of the things we think about StrengthsFinder right is teams are well-rounded, people aren’t. And so we try to put together, I always look for people who have high Responsibility and high Discipline because I don’t have any of that. And so, for me, I’m all over the place and I need someone to kind of rein me in or make sure that what I said we actually do, whether the materials arrive on time or a lot of those kinds of things. [00:20:20] And when they come out from that perspective, man, you don’t have to do that much management. When you give someone a job they want to do, the managing is a side thing. And so how do we do that? Yeah, I have 40 interns on the campus for the summer. I’ve got a whole team to help out with other people who want to help. And I have interns who want to be here. So it makes a big difference. I think take it slowly. Little changes day over day and be consistent with them. Lisa Cummings: [00:20:45] Yeah, really smart because those add up so fast. Jim Collison: [00:20:47] They really do. People overestimate, yeah, they overestimate what they can do in a month and underestimate what it can be done in a year. It’s just one of those things. In 365 days of making, if you did one thing a day, if you removed one file a day from your computer, I took down one video that we’re not using. I can do 350 videos in a year. That’s a lot. Lisa Cummings: [00:21:12] It’s a lot. Jim Collison: [00:21:13] So if I just did one a day, and if it took me one minute, how much is that really impacting my day? Now, apply that to your own situation. Sometimes when you look at this there’s like 350 videos I’ve got to get rid of. Seriously? I mean, that’s a lot. That might take me a whole day. Well, don’t ruin a whole day. If you can stretch that out, or if you can do a little bit at a time, or you can think about scalable processes, those all really matter. Lisa Cummings: [00:21:34] I really liked how you mentioned making yourself scalable through the partnerships. Talk a little bit about that. How do you approach those partners when you think you’ve found someone who has complementary talent to you, or something that you don’t have that would really help the project or the business outcome? How does that all go down? Jim Collison: [00:21:51] Yeah, it’s helpful for me because I have these Influencing Themes. [00:23:10] And I said, “Hey, why don’t you come by? Just come by. No responsibilities, just come by and see what we’re doing on a Saturday.” So he popped in. When we were done he’s like, “How do I get involved?” Right? And so, one, you have to ask. It’s super important. You can’t do these things. People won’t come to you. Oftentimes you have to ask, or at least plant the seed. Give them the opportunity to do it. [00:23:32] But, two, take every advantage of watching people. We call that kind of Strengths spotting, if they have the StrengthsFinder. I know sometimes when people are at their best. Lisa, you probably have a set of questions you can ask. I always say, “What energizes you?” And they’ll say a bunch of things. Like, “What’s your best day?” That’s another question. Like, “When you’re at work and you’re having your best day, what are you doing?” You can oftentimes get clues about their high talent themes by hearing about what they’re doing, what energizes them. [00:24:03] Then if you can tweak their job or tweak their role or give them opportunities, whether big or small, if you can give them opportunities in that area, oftentimes they’ll just start to soar. And, of course, there’s always parts of our jobs, things that we hate, you know, that we don’t like to do them, but you just have to do. That’s never going to go away. Right? Like I hate budgets. Never going to go away, so I have to learn to deal with them. Lisa Cummings: [00:24:27] You can’t even outsource it. Jim Collison: [00:24:29] Well, in some cases you can. I try. Trust me. I tried to outsource as much as I can when I’m not good at it. It is a situation where you can kind of just look. Jim Collison: [00:25:02] Yeah. Lisa, you’ve got to be willing to give it away. That’s the other kind of side of this, is you can’t tease people with these things and then be a control freak and say, “Oh, I’m just kidding. I kind of want you to do it my way, and if you don’t do it my way I don’t want you to do it.” That doesn’t work. You have to be willing to let them completely consume it and take it on and guide them. [00:25:23] I always equate management a little bit of a boat going down a river, right? And it can wander around the river channel. And as managers, I think if we want to keep the boat in the center of the channel, or the most optimal spot, you kind of have to tap it on the sides, little tiny course corrections. I heard a statistic data, a flight between L.A. and New York City, even while the airplane is on autopilot, the pilots make dozens or maybe even hundreds of adjustments to the plane while it’s making that, going to their destination. And if they didn’t they would be completely off at the end. [00:25:57] And so I equate management to like that. Sometimes it doesn’t mean a whole course correction. We don’t need to come up with whole new ideas or completely new ways of doing things. With people, sometimes we just need to tap on the sides a little bit. And so in a situation with Zach, I need to let him run down the channel, and then when I have some ideas just tap on the side, “Oh, hey, Zach. Think about this,” tapping on the side, “Think about this,” getting him just right back. [00:26:21] Now, in Zach’s case I do very little tapping, right? But with a lot of my interns, though we do a lot of tapping where we come in and say, “Hey, here’s a lesson for today.” And they always say, “Oh, Jim’s coming in with a sermon.” But when we do that, again, it’s that little visual just kind of tapping on the sides keeping them on course. And I think those little taps, like people really don’t feel them, they’re like, “Oh, okay. That’s cool.” It’s those big shocking, “We’re going to change everything and it’s going to be great tomorrow.” People don’t like that. I prefer, from a management perspective, of coming at it knowing where their channel is, and then just tapping on the side to keep them in line. Lisa Cummings: [00:26:58] What a great reminder because you want the Strengths stuff to be digestible and of interest to people, so if you’re trying to change the whole world you might actually turn them off. So do the little stuff. I love the metaphor to end with. [00:27:09] This has been such a blast, Jim. I know people want more of you. I’m definitely recommending everybody listening, go out to the YouTube channel where you can see Gallup has lots of great channels. The one that I think you’d really, really love is Theme Thursday because you can take your talents and your team’s talents and dig in for an hour at a time. So check that out. I’ll put a link to that in the show notes as well. What else would you recommend if they want to get more of Jim Collison in their life? Jim Collison: [00:27:34] Well, first of all, if you want more of Jim Collison you might be a little sick, so get that checked out. Called to Coach. That’s another webcast that we do. That one is kind of designed for coaches, but if you’re a manager and you’re thinking about – in fact, coaching and managing are very, very close in their skillset – and so you might be interested in hearing stories of other coaches that have used StrengthsFinder in a variety of situations. [00:28:09] That one is global, so we do interviews in India, and in Singapore, and in Australia, and here in the United States, and we have coaches from all over the world. We even have a Spanish version available now if you want to get that in Español, so that’s available for you. Just search Called to Coach, or search Theme Thursday, and either one of those will come up in your podcast player and then you can listen to the audio as well. [00:28:29] If there’s one web address to remember, it’s the one I mentioned earlier – Coaching.Gallup.com. You don’t have to be a coach to come to that site. It’s a big Strengths enthusiast site. We just started it with coaching in mind, but there’s tons of resources and tons of material out there that’s available for you. Lisa Cummings: [00:28:46] So great. And managers or coaches, and when you’re tapping that boat down the river that’s exactly what you’re doing, so what a great resource. [00:28:54] Thanks, everyone, for listening to Lead Through Strengths. Remember, using your strengths makes you a stronger performer at work. If you always focus on fixing your weaknesses, you’re choosing the path of most resistance. And if you’re leading a team you’re subjecting them to that as well. So, claim your talents instead, and share them with the world.